NICE! Can´t wait for 1.8! I bet that the mushroom in the bottom middle will be like the snail in Adventure Time, it will be an easter egg in each pre-update pic. Well this is intresting, rafting anyone? I have been waiting for rivers to come to minecraft! Cant wait! will it have a current? Is that one of the big red mushrooms at the bottom? What's that red thing in the bottom of the shot? Mushroom? Why is the mushroom on the riverbank... is this a possible way for giant mushrooms to spawn? There's another one of those mysterious giant mushrooms. 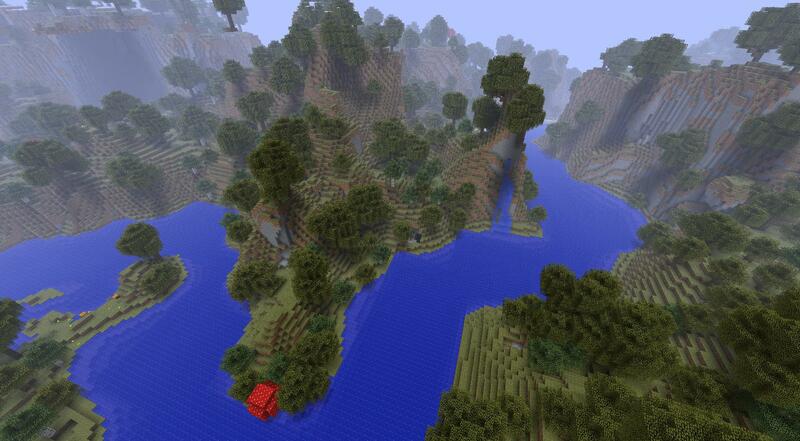 but the oceans in minecraft are so small...there essentially already rivers? Sweet! Keep the info coming! Amazing. I noticed something near the top left behind a tree. Looked dark reddish did anyone else see this?